First lady bug of the year. You can't see it. But it's there. Anne and Bethany came over for a right proper picnic today. 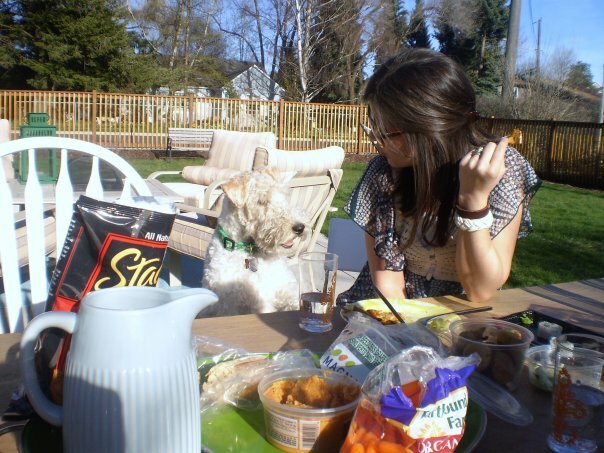 We sat in the sun and sampled the Co-Op's deli selection, and swatted nosy puppies away from the grapes. I like days like today because I am a child of the sun, hot summers, and tanned skin. In all the hippy dippy ways. Also my hair is finally long again, and as we all know, summertime is the time for long hair. Moscow is so good in the sunshine! I've been thinking about my Saltwaters, which are just beginning to leave tan lines on my feet. I've been thinking about making my hammock dates a regularly scheduled affair. My bedroom walls are the perfect color gray when the sun hits just right. I've also been thinking about my recent deal with The Holbsterama: Toilets cleaned in exchange for folded laundry. What a steal! I do not do toilets. Summer, I am your biggest fan. Here let me kiss you.